Daniele Sarno was born in Rome on 08.21.1971 and resides in Grosseto . In the 90s is part of the circuit of the “cantautori romani ” that revolves around the “Locael” alley of the fig tree , he wrote music and lyrics for the stage . In 2001 he signed with Bungaro and ” Kanzi ” Patrizia Laquidara , awarded the Tenco 2006. Since the summer of 2004 he started an intense piano since 2007 and has resumed performing live proposing unpublished repertoire . In the summer of 2009 was openact of Simone Cristicchi. He active in a side project of singer-songwriters , co-written with guitarist Francesco Petrucci . In the summer of 2010 he won the ” Fuorimetrica Festival” Genoa and the ” Fuorimetrica Festival ” has toured Italy in clubs in acoustic trio . Last year, he continued to live in a duo with the stickista Lazarus , promoting the Stick ( hybrid instrument rarely used in pop) . To the rhythm has changed a cajon playing it with his feet , alternating between guitar and bass. 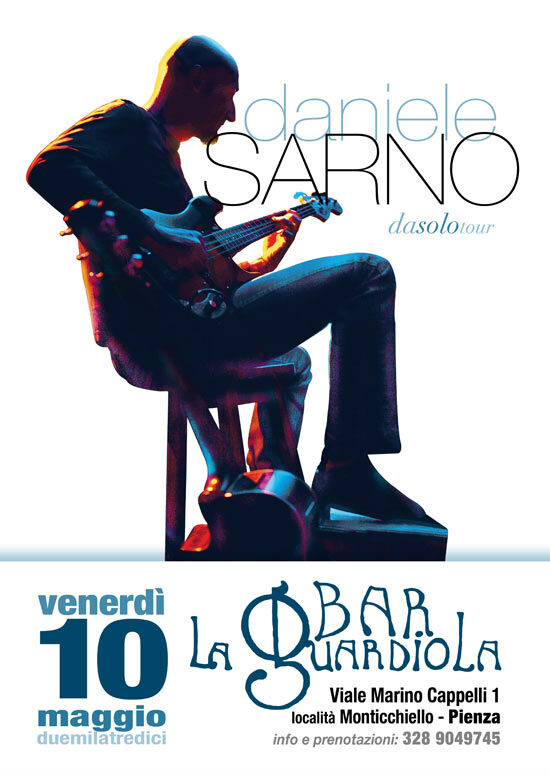 This experience and some trial dates have formed the embryo of the ” daSolo tour,” a new show where the songs , with arrangements necessarily skinny , are not affected by voltage dips , rather lyrical and rhythmic minimalism and the pattern are enhanced by ” salottino” chatty it creates. Carpet , floor lamp , the delicious vanilla and a few covers embedded in the repertoire , give the concert a convivial atmosphere where the ” canzonaio ” welcomes people .